Stewart, Lillian and Erin James-abra. "Burgess Shale". The Canadian Encyclopedia, 17 January 2019, Historica Canada. 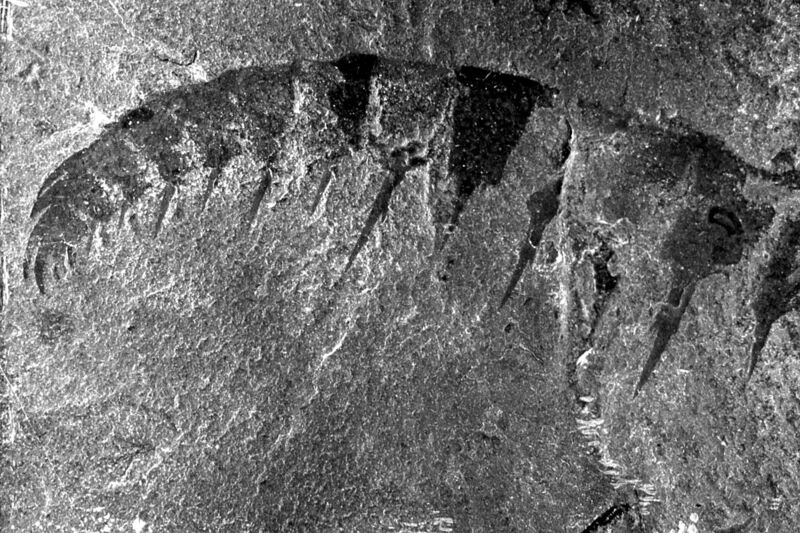 https://www.thecanadianencyclopedia.ca/en/article/burgess-shale-fossils. Accessed 24 April 2019. The fossils in the Burgess Shale capture the end of the Cambrian Explosion, when, over millions of years, most major animal groups appeared in the fossil record. While there are sites around the world that feature fossils from the Cambrian period, these sites mainly include hard-bodied organisms such as shellfish. By comparison, the Burgess Shale is primarily made-up of rarely preserved soft-bodied organisms, providing scientists with the world’s clearest record of Cambrian marine life. These organisms lived in the sea that once covered the location of the Rocky Mountains. Sediment flowing into the sea buried both dead and living animals. As more and more sediment accumulated, the organisms were compressed and fossilized. As this process repeated, the layers of fossils now found in the Burgess Shale were created. On 30 August 1909, American geologist Charles Doolittle Walcott stumbled upon what is now the original Burgess Shale site in Yoho National Park, between Wapta and Field mountains. 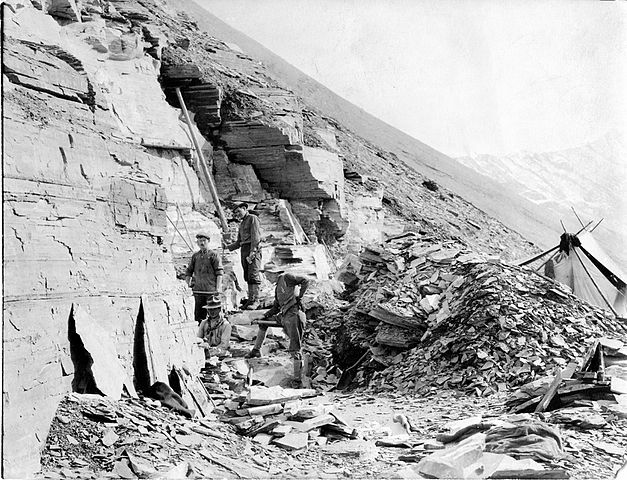 Walcott’s first visit to Yoho had been in the summer of 1907, because he was interested in the beds of trilobite fossils (marine animals from the Cambrian period) on Mount Stephen. The next day he returned with his second wife, Helena, and his son, Stuart. Between 1909 and 1925, uncovering the fossils in the area would become a family affair, with Walcott returning to the site frequently, often with his family in tow. After Helena’s passing, this team included his third wife, Mary, and one or more of his four children. Eventually they dug a quarry, now known as the Walcott Quarry. In 2012, researchers found a Burgess Shale fossil bed in northern Kootenay National Park, near Marble Canyon. The team included Jean-Bernard Caron (Royal Ontario Museum), Robert Gaines (Pomona College, California), Cédric Aria (University of Toronto), Gabriela Mángano (University of Saskatchewan) and Michael Streng (Uppsala University, Sweden). Like the Walcott Quarry in Yoho National Park, the Marble Canyon site is home to an abundant array of diverse fossils. About 150 species have been identified using fossils from the Walcott Quarry in Yoho National Park, and 55 taxa (or groups of organisms) from the Marble Canyon site in Kootenay National Park. Among the species discovered in Yoho is Pikaia gracilens. This small, eel-like animal is the most primitive known vertebrate, making it the oldest ancestor of all other vertebrates, including humans. With a maximum length of 100 cm, Anomalocaris canadensis was the largest predator during the Cambrian period. Fossilizations of this creature, which looks a bit like a shrimp, were also found in the Burgess Shale at Yoho National Park. While the majority of fossils in the Burgess Shale in Yoho and Kootenay national parks record the same creatures, there are handful found at Kootenay that haven’t been found at Yoho. For example, Primicaris, a type of anthropod (a group of species without spines, such as insects) was found at Kootenay. Previously, fossils of this creature had only been found in China’s Chengjiang fossil beds. E.G. Briggs, D.H. Erwin, F.J. Collier, The Fossils of the Burgess Shale (1994).